What exercise is more intense than walking, but easier on your knees than running? It’s easier to do outside in the winter than jogging or biking, because a little extra weight or thicker clothing isn’t an issue? It’s good for cardio conditioning and building strength at the same time. And it doesn’t require a team, any expensive equipment, or even a gym. Rucking is basically a 2-in-one of cardio and strength. You can vary the proportion of each by varying your speed and the amount of weight you carry. 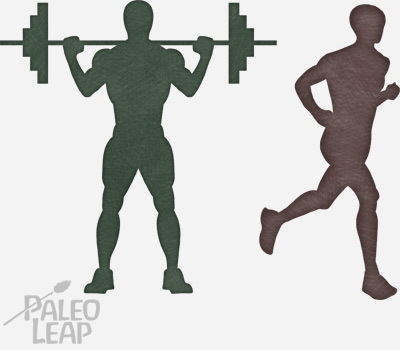 Imagine a whole spectrum of ways that humans can move while carrying weights. On one end is a super-heavy yoke carry or farmer’s walk: a trained weightlifter can carry a load much heavier than her own body weight for short distances. On the other end is completely unweighted walking: you can go a longer distance with 0 weight. Rucking is somewhere in the middle: carrying a significant percentage (30+%) of your body weight for several miles of fairly speedy walking. The load is heavier than the ankle or wrist weights you sometimes see joggers wearing, but light enough to go for several miles at a time, which you probably couldn’t do with a couple hundred pounds on a yoke. A multi-day hiking trip is basically a form of rucking, but it’s also perfectly possible to go out for a few hours of rucking and then come home without any tents or camp cooking involved. Can’t decide? Do both at once! Carrying around a heavy backpack (a significant percentage of your own bodyweight) increases the intensity of walking as an exercise. One study found that the calorie burn during weighted walking was essentially equivalent to running (and in some cases, it was actually higher). In fact, this study suggested that walking with a backpack load actually demands more energy than walking with the equivalent amount of body mass. That’s probably because weight in a backpack isn’t distributed as evenly and efficiently as your own body mass. Body fat is spread pretty evenly to your front and back, but if you’re carrying a backpack the weight “pulls” to the back, so all the muscles in your spine have to work harder just to keep you upright. 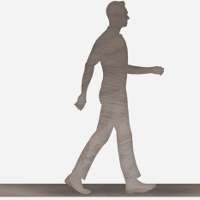 Walking with a weight also increases the load that the movement places on the skeletal system. That’s actually good, because loading your skeletal system stimulates the bones to grow stronger. That’s why weight training helps build bone density. Adding a heavy backpack is basically making walking a little bit like weight training. Weighted walking in general is also very helpful for older people, who might have mobility limitations that prevent them from running or doing other types of strength-based exercises like squatting. Obviously, the older and more frail someone is, the lower weight they’ll have to use, but even pretty small weights can be helpful. For example, this study found that exercise wearing a weighted vest improved important predictors of falls in elderly women. This study, also in elderly women, found that weighted exercise was superior to regular exercise for developing balance. Every exercise involves risk. The only way to avoid all risk of physical injury would be to hide away completely sedentary in a padded room – in which case you’d quickly get very sick from inactivity. It’s really just a question of what dangers and risks are acceptable. Knee, ankle, and other joint pain: heavier weights do put more stress on the joints. A lot of those risks can be reduced by using good, well-fitted gear and basic common sense. A safe place to walk. Sidewalks are fine, especially for beginners, but trails and hills are more challenging. Going up and down hills challenges different muscles, so if you want to build the most functional strength, find a place where you can get some incline and decline action. Something heavy. Weight plates or kettlebells are convenient because they’re already marked. Heavy things that aren’t weights include: 2-liter pop bottles filled with water (about 2 kilograms, or 4.4 pounds), bricks (usually around 5 pounds each), 10-pound bags of rice, your canned food stash, and sandbags. A bag to put the heavy thing in. Think more “hiking backpack;” less “cute tote.” It should be able to take a beating, and be stable on your body. In the past few years, studies have been coming out about how bad it is for kids’ backs to be lugging around enormous heavy bookbags all the time. Those studies aren’t wrong – carrying a heavy load on your back with poor biomechanics and lousy load distribution is a bad idea. The point of rucking is to properly distribute the load precisely to avoid that problem. This review goes over some important points about load distribution and what kinds of packs are best. Using a backpack with a hip belt (like the ones on hiking packs) transfers more of the load to the big muscles in your legs. Using a backpack without a hip belt keeps more of the load on the relatively small muscles in your shoulders and upper back. Unless you specifically want to get an upper back workout, a hip belt is probably a good idea, especially at higher weights. Carrying half of the load to your front and half to your back reduces the amount of postural adaptation necessary to stay upright and puts less stress on the spine. Rucking is nice as an outdoor winter sport because you can bundle up without restricting yourself. It’s hard to run in thick overalls or heavy boots, but they’re just fine for rucking. That depends on how much you weigh and how strong you are. “Light” in rucking terms is around 20% of your own body weight. Trained soldiers can carry 60% or more of their own body weight on ruck marches. People who just aren’t very strong yet or who have some joint trouble might want to carry less, and that’s totally fine. Rucking (or just weighted walking in general) is a fun way to enjoy one of the most natural human movements: carrying stuff around. If there ever was a form of functional strength, this is it. There are some risks, and people with posture issues or other imbalances might want to avoid hauling around half their bodyweight on their back for long distances. But for most people, it’s an effective exercise without any extreme risks compared to any other type of exercise, and a nice way to get out of the house for a workout even when it’s cold.